Okay. It's that time of the year again. The pre-season has started. Kraft Hockey Day in Canada has come and gone. NHL hockey is back again. So start talkin' hockey here eh. Canucks have lost 2 defencemen to Injury after their first pre-season game. ^ Whoa.... And Jordan Staal broke his leg a few days ago too. Not a good start to the season for a number of players. The Leafs finally showed up for a hockey game eh? Made the Rangers weekend a bit miserable in doing so. Oh well...it's still super early in the season. Nice to read about the Habs coming back from a three goal deficit in Phillie (sorry Doug!). The Flyers need to get out of the habit of having slow starts to the season. Especially if they want to make the playoffs this year. for $200 CDN, you can watch every single NHL game on Rogers Game Centre Live. What is this world coming too? Are Buffalonians going to stop drinking beer now?! Will it no longer snow?! No more bowling, billiards, and chicken wings?! I mean to me, hockey is in our blood! Not that we've been the most spectacular team, but how can we be last? *sigh* I hope things turn around soon. Well...I'm happy to see that both my teams, Canucks and Habs, are doing pretty good...right now the Canucks are certainly exceeding expectations. Tied for first overall. Okay. I'm not expecting them to be there at the end of this month...never mind the end of January. Seems like Ryan Miller has settled in quite well (sorry Sentire!). I'm happy they managed to get the shootout win over the Ducks too. I'm also hoping the Jets have a good season. Didn't look too good in the first few weeks but they seem to be doing okay now. I had no idea the Canucks would be where they are in the standings. I don't expect them to be in first place by the time the playoffs come around but well...what do I know? Sabres went on a scoring spree against the Maple Leafs. I'm happy. I'm not so happy about the Canucks getting blanked by Arizona. ^ Yup. 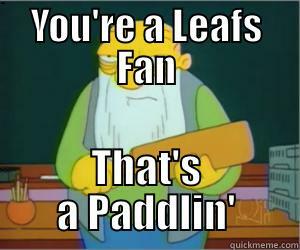 Anyone cheering for the Leafs these days needs a bit of a spanking. Ryan Miller and the Canucks won their rematch against the Panthers tonight. Bobby Lou (aka: Roberto Luongo) won back in Vancouver a short while ago on his first trip back since he got traded. Today Miller didn't succeed in notching his third consecutive shutout though. That would've been nice. But we'll take the win. Seems Toronto is really getting a reputation right now as well. We won't even discuss Buffalo. Meanwhile the Sabres woes continue. They lost to the Oilers last night and then to the Canucks tonight. Sorry Doug: Flyers scored first against the 'Nucks...but they're down by two now. Meanwhile the Sabres picked up a S/O win over the Bruins. Helped the Sens gain some ground on the Bruins. Between Lindback helping them win and Arizona tanking they may not get Connor McDavid now in the draft. Be interesting to see if they try more actively to lose and get the top spot in the draft. Well the Caps did the Ottawa Senators a big favour tonight by beating the Boston Bruins. Keeping my fingers crossed that the Sens can capitalize on the opportunity. Sorry to see but the Canucks lost to Calgary. In some ways though it is nice to see Calgary do so well given their rebuild. Same with Winnipeg. The Caps though broke their 7th game woes and beat the Islanders to go. To face the Rangers. Again. Like every damn year in the playoffs lol. Caps and Rangers...again eh. I think we have the Lightning facing the Habs again. I'm keeping my fingers crossed there. The Habs had problems with the Bolts during the regular season.